I thought I'd share with all of you my experience at the U.N. For those of you who don't know what the U.N. is, it is an international organization that stands for the United Nations. It's mission is to confront issues concerning humanity such as peace and security, climate change, sustainable development, human rights, disarmament, terrorism, humanitarian and health emergencies, gender equality, governance, food production, and more. Personally, I think the organization has failed more than it has succeeded in its goals, but that doesn't mean I wouldn't be interesting in visiting its headquarters in NYC. My French teacher was so generous as to organize a class trip that would take us to New York City for the day. I was worried about the possibility of rain and lousy weather, but was relieved when we stepped off the bus and soaked in the sun. The weather turned out to be so warm that I didn't even need my jacket! After showing our I.D. 's and going through security checks, we met our tour guide. As part of his introduction, he stated his Italian nationality and then asked each of us what ours was. It was amusing to have everyone go around the group and say they were "American." During the tour, we were escorted through many rooms, called "chambers," designed for holding council meetings. Some of the U.N. chambers we got to look in were the "Economic and Social Council" chamber and the "Security Council" chamber, which had a beautiful painting on the back wall. In each room, there was a circle of desks with nameplates to identify each represented country. Behind each desk were two chairs designated for the diplomat's assistants. In the middle of the arrangement, there is a desk for the president. Every month, the members take turns at being President of the Council. The last room we got to observe was the General Assembly. 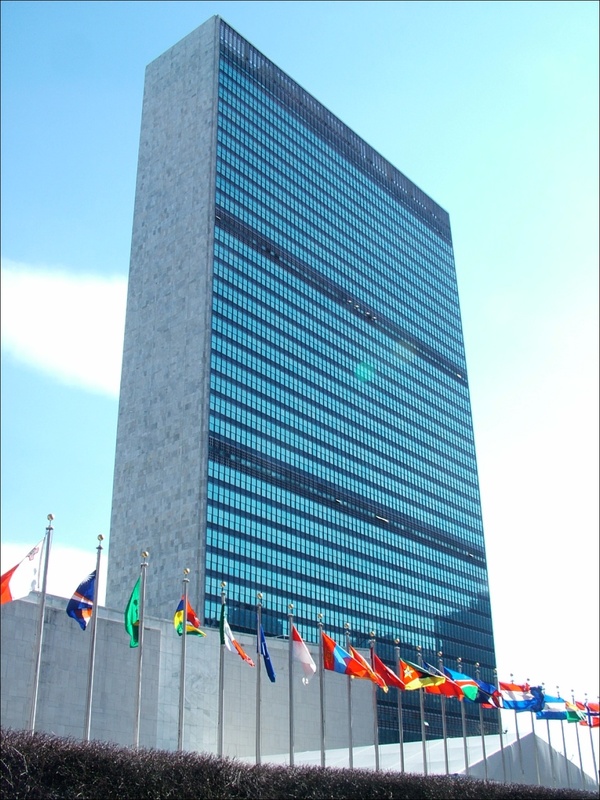 It was the largest room in the building with the capability of holding all 193 members of the U.N. The room is designed to act as a unique forum for "multilateral discussion" on international issues that the organization covers. One thing the tour guide described that stood out to me was former president Harry S. Truman's unique interpretations of the paintings in the room. On one wall, Truman thought he saw a scrambled egg, while on the opposite wall, he was reminded of Bug's Bunny. I'm not sure about the Bug's Bunny painting, maybe because the cartoon wasn't in my time so I wouldn't recognize it, but I could definitely make out the scrambled egg! Once our tour was finished, we were escorted to the lower level of the building where the gift shops were. I wasn't planning on buying anything until something caught my eye. I love to take home souvenirs from a place I visit, but if I'm going to buy a souvenir, especially with my own money, then it has to be worthwhile meaning something I will definitely use, display in my room, or keep later in life. When I beheld a decently-sized glass object that could balance on a diagonal tilt and had the U.N. symbol engraved on it, I knew I had to get it. As of right now, I still have it placed on my dresser to be observed and admired everyday. I also decided to mail myself a post card. The U.N. is technically not on U.S. soil so the post card would have a different stamp on it which I thought would be intriguing to receive in the mail. In fact, I believe mailing yourself a post card should be a part of everyone's U.N. experience. Why not take 65 cents out of your wallet for a unique stamp from the United Nations? Wanting my post card to be special, I decided to buy one from their book shop rather than from their post office. On the front cover of my card was artwork by the Brazilian artist, Octavio Roth, who creatively inscribed Article 18 from the U.N.'s Universal Declaration of Human Rights. It was my favorite article from the declaration since it discussed the freedom of thought and religion. Our tour guide had described to us how the artist collaborated with children to help his drawings for each of the articles show true creativity and stand out. When our class regrouped, we headed back outside to enjoy a pleasant walk in the city. After taking in much of the city, we ate at a French restaurant called Matisse for lunch. I ordered trout with lentil ragu which was very delectable. The fish was perfectly cooked and the lentils were hot enough to melt in your mouth. So concluded my trip at the United Nations! It was a nice experience that I will never forget sharing with my French class, not to mention getting to miss a whole day of school to get to be in the city!